Back in Austin for SxSW Eco this week, I was reminded of a photo I took during the same event in 2013. The Austin Bike Zoo evolved from the imagination of a collection of bike-builders, puppet-makers, and performers. Their work includes birds, snakes and many insects. This image shows Treasure riding a very large Monarch butterfly, a migratory species that breeds in Canada and over winters in Mexico and which has seen a population crash in recent years (latest news this year suggests there may be something of a recovery happening). 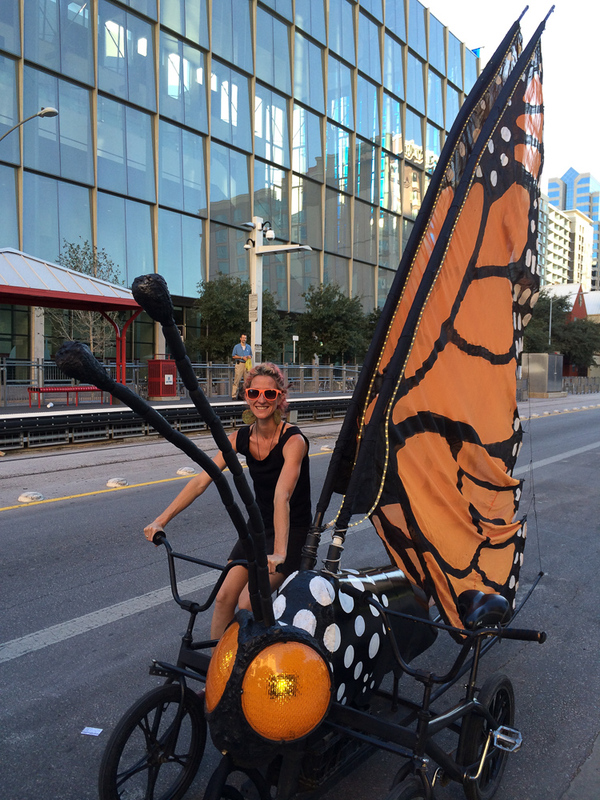 Creative efforts in support of conservation and sustainable urban mobility. Thanks to coming to take a look.